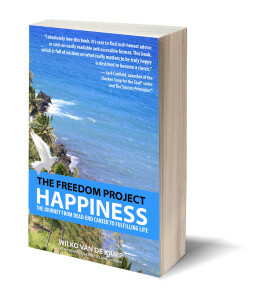 As of today, Amazon has the newest book in The Freedom Project series, “Happiness” also available on Kindle. The paperback book, originally released in October 2015, quickly became a number one hot release on Amazon. To now further share the author’s journey from dead-end career to fulfilling life, it’s available on Kindle worldwide. The Freedom Project: Happiness is really a book about work. Whether you have a job (employees) or own a job (entrepreneurs), for most people work does not equate to happiness. That’s why this book is an unusual book about work. And that’s why you’ll want a copy of it – because in the end, everybody wants happiness. climbed the corporate ladder and built a successful career. despite his “success”, felt empty and unhappy inside: a corporate cubicle job did not bring happiness. quit his job to start his own business, only to see it go to zero and (almost) hit bankruptcy. discovered happiness wasn’t about being an employee or an entrepreneur: unhappiness exists on both sides of that often debated fence. reconnected with his passion, and escaped the claws of unhappiness and depression. now lives a life of freedom in terms of money, time and location. This book is the sequel to bestselling travel hacking and lifestyle book “The Freedom Project: Travel”. The Freedom Project: Happiness reveals a life-changing blueprint to implementing the freedom that can be found while traveling right at home. It will reconnect you with your passions and inspires to live a meaningful life.